Back in 2013, I did a very strange thing. Why on earth would anybody choose to run 30 miles on a treadmill? Yes, it was another of Grandad’s mad challenges. The prostate cancer motivation was imminent surgery for the condition. The L’Arche connection was longer standing. L’Arche is a charity for adults with learning disabilities. 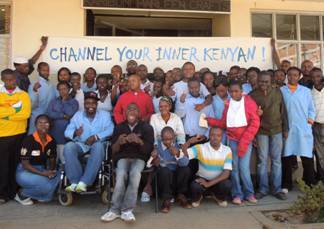 Over the previous 3 years, I had helped raise funds for a new L’Arche home in Edinburgh, now up and running, and a new L’Arche community in Kenya, that I visited in 2012. 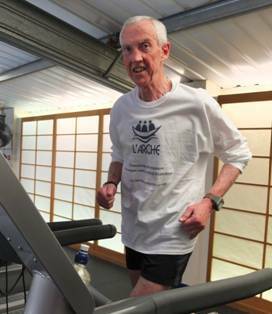 I was on my own, 3-4 hours in to the run, when I had an unexpected visit from Mandy Orr of L’Arche’s Edinburgh office. She was carrying an A3 sized photo message from my wonderful friends in Kenya. It was the perfect motivational boost. I completed the 30 miles within my target time. I think I’ll carry a miniature of the picture with me in London. By 20 miles I’m sure I’ll be needing to “CHANNEL MY INNER KENYAN”! The Down Side To Running…. Now, I hate to be negative especially on our second post but I would like to address a common point of view which has been expressed to me quite a lot recently. It’s the “running is bad for your joints” “you’re better off just going for a brisk walk” attitude. I have to say that having packed in quite a lot of miles over the last few months, possibly overdoing it a bit, I have sustained an injury to my left shin. Nothing serious but seriously annoying. It has meant i have had to take several weeks, six to be precise, off running. When training for a marathon this is quite a set back. I have tried to keep fitness up by replacing running for cycling or walking but really there is no substitute. It was the beginning of December when I started to get this reoccurring pain in my shin. Rather that stopping and listening to my body I decided to ignore it and hope it would just go away. We then did an 18 mile road run. It was such a good day. The weather was cold but clear, we had a stunning route along the coast road between Applecross and Shieldaig. This, as far as my leg was concerned, was the final straw. Several weeks later things seem to be back on track. But I am sure there will be other injuries along the way. Hopefully not before we head off to London. Whilst running recently, we have started to discuss what times we would like to make in the London Marathon and plan for how best we can achieve this. Will we be disappointed if we don’t make those times? probably. But what I have realized is that it is what we are doing now, here in Applecross that is important. It’s the training, the consistent exercise, the getting out there what ever the weather that matters most. 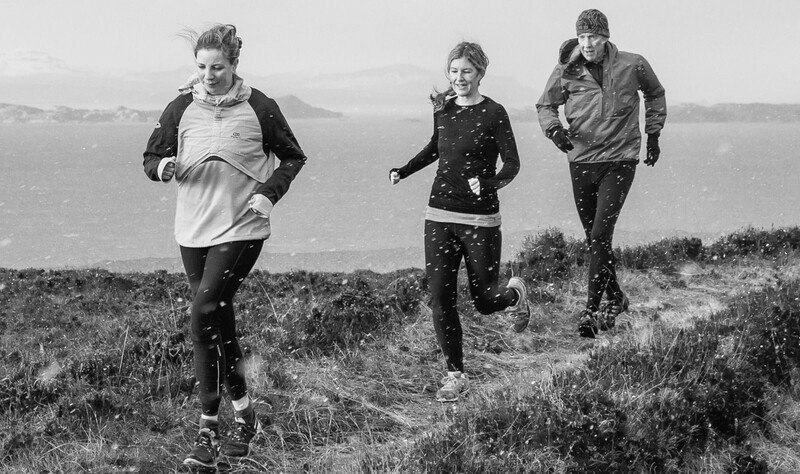 Yes we could just go out for a walk but there is something addictive about running. Getting a P.B. in an everyday run. The races planned are really just for motivation to keep you going. London is just one stage of what I hope to be a lifelong running journey. It may cause some wear and tear for your limbs but it is unarguably good for the heart and soul.